Your pet will step out in style with these high-quality, handmade kerchiefs. 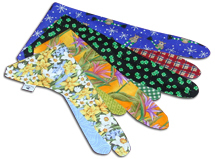 From the whimsically bright primary colors, to the gentle floras, Pawkerchiefs® make a statement wherever your pet goes. At Grande Paws all our fabrics are carefully selected from the finest comfortable cottons and available in many different styles of prints. And, they're reversible, with two distinctively different sides. Don't forget our seasonal selections. We offer holiday styles for Valentine's Day, Easter, Hanukkah, Halloween, Thanksgiving, Christmas...just to name a few. 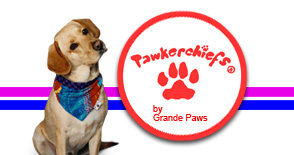 Please click on the "BUY ME" button at right to see and choose the Pawkerchiefs® that's right for your little one.